I always feel especially happy when I’m asked by a friend to create a bespoke piece of jewellery. On this occasion, it was even more special as it was to be a gift commissioned in celebration of a 40th birthday and the design had to reflect both the birth date and, more importantly, the significance and value of a long-standing friendship. I had suggested something along the lines of a Celtic Claddagh, representing love, friendship and loyalty, but my friend had a very definite (and very different) idea in mind. She told me that the birthday girl was fond of large, bold pieces of jewellery. After some research, she had decided upon a Maori Friendship Twist as the perfect solution. 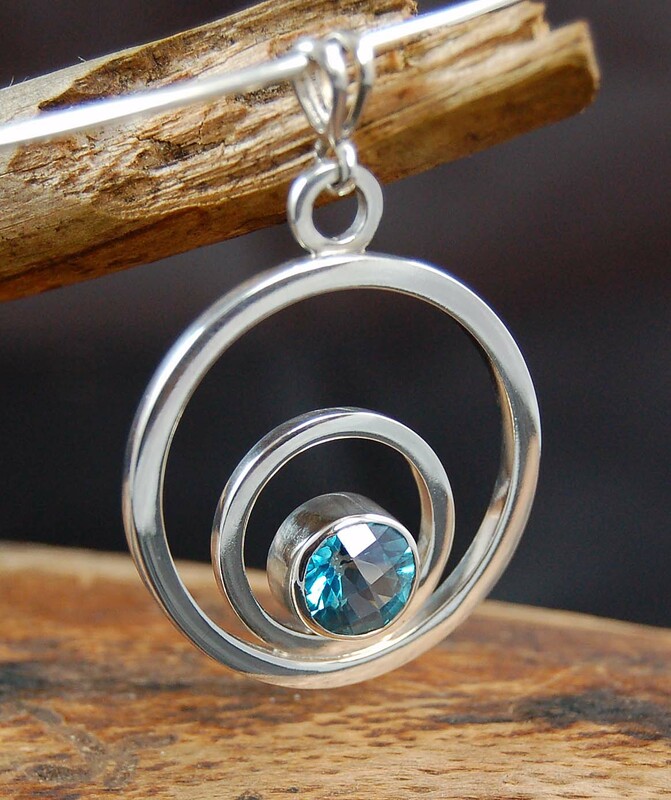 Adding the wave effect ‘arms’ to the centre of the design presented me with the ideal location in which to set the beautiful Swiss Blue Topaz stone I had bought to compliment this piece. So, with the design parameters all now met, it was time to set to work. I started by converting the design sketch into a black and white image that I could apply to thick silver sheet using transfer paper. My choice of method was influenced by the fact that I wanted to create a 3D effect where the twist overlaps to form the bail loop. Rather than tracing out the flat design and then using my piercing saw and files to achieve the desired grooves in the metal, I opted for etching the shape onto the silver, thereby allowing the acid to eat away the metal to create the effect I wanted. 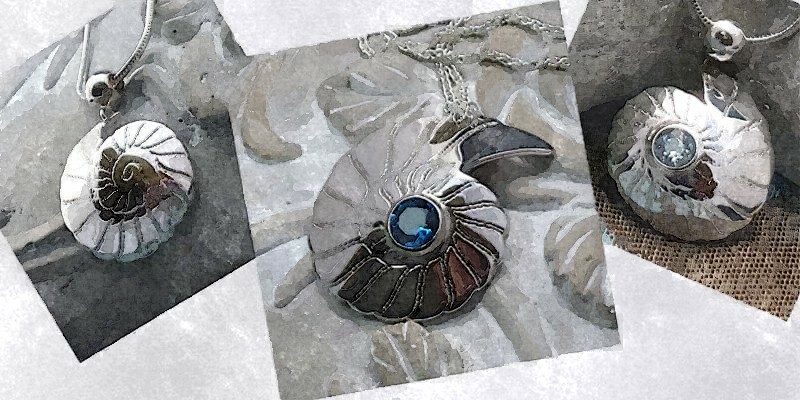 The next task was to fabricate the bezel setting for the stone and then solder that into place between the ‘arms’ which would appear to hold the gemstone at the centre of the pendant. A circular bail of half-round wire was then made and attached to the bail loop. After the usual processes for finishing with emery paper, Tripoli and Rouge polish, the stone could be securely set within the bezel. I am very pleased with the result and am happy to say that so was the lucky birthday girl! 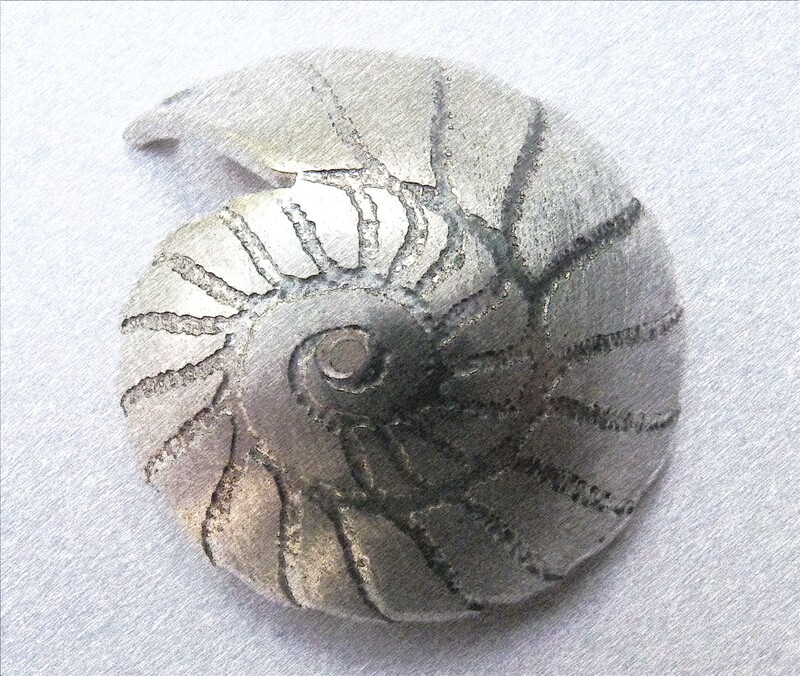 Having achieved a more three dimensional effect by shaping and doming the etched fossil shapes to make the cufflinks, I wanted to play around a little bit and see what other pieces this design could work with. 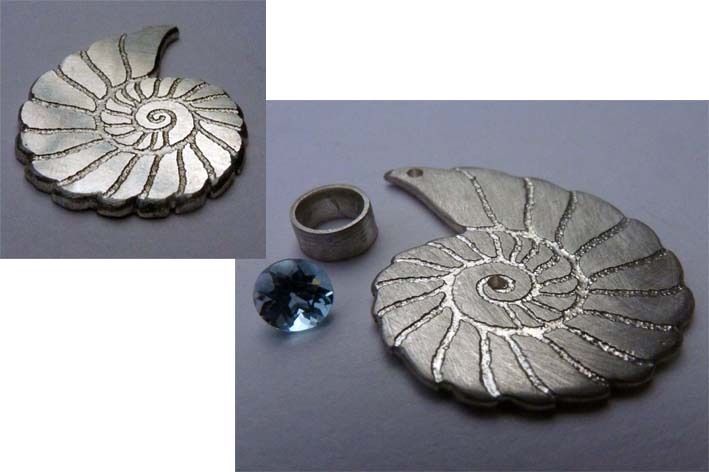 Having etched and pierced out the spiral fossil design in two sizes, I thought I’d start with the small piece (a little more tricky to work with as the detail is finer, but less to lose if all goes awry) and adapt the design into a pendant. 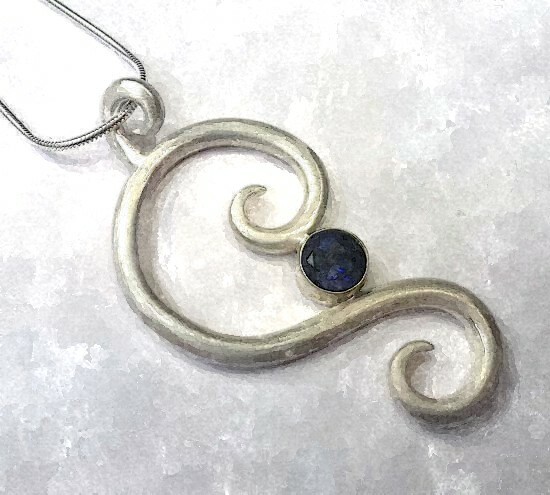 Although I now know it works and will no doubt be tempted to make a plain silver version, I wanted to enhance this piece with a small gemstone. I chose an ice (or sky) blue topaz, only 4mm in diameter, but which I thought would provide a good focal point. 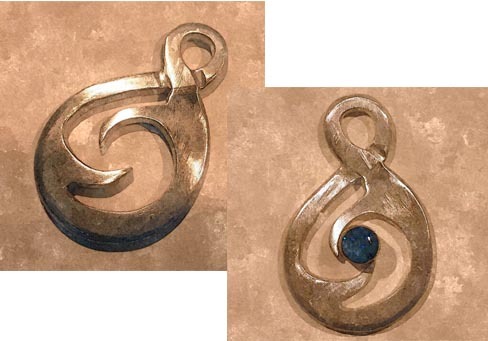 After some careful preparation of the piece with files and emery paper, I constructed a bezel to fit the stone from bearer wire and drilled holes into the pendant where I wanted to place both the gemstone and the bail. Before marking out and piercing the hole for the bezel, I used a doming block and punch to raise the design into a convex form. Above you can see the result of forming the metal. Once the bezel was fitted and soldered and the bead bail soldered in place, a thorough cleaning and finishing had to be completed before the stone was set. A final buffing around the bezel to remove any inadvertent setting marks and a good polish and the piece was complete. 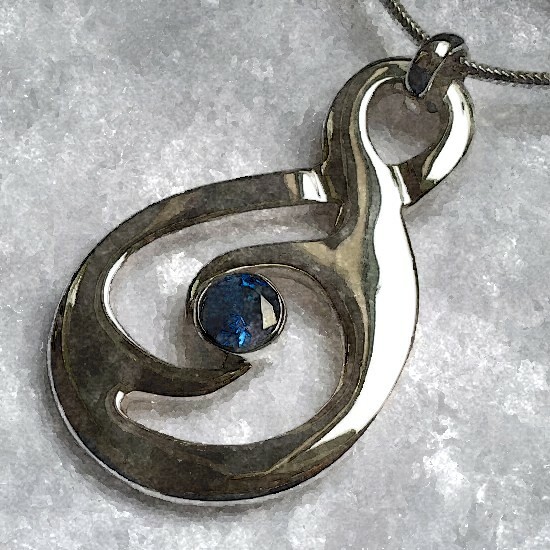 The finished pendant is now with the Assay Office for hallmarking and I’m ready to tackle the larger version for which I’ve reserved a stunning 7mm round London blue topaz – can’t wait to see the result! How a Glass of Wine Inspires? Here are some examples from my latest collection of rings – the ‘Symmetry Collection’. 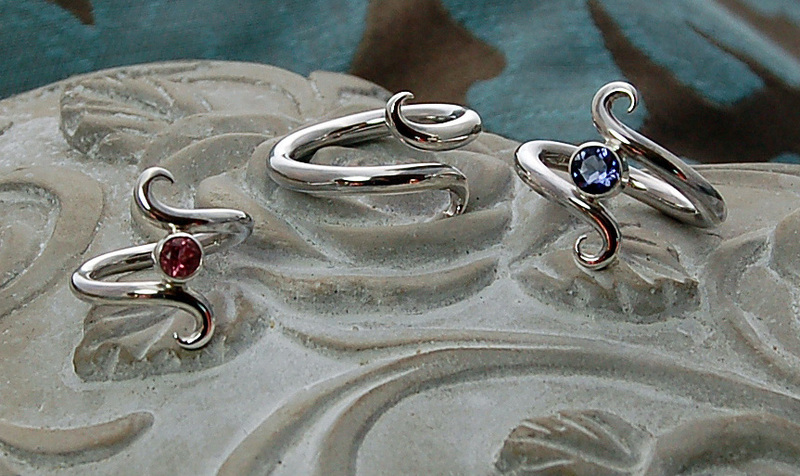 Each ring has been hand forged from solid sterling silver, one example is a simple plain band of silver with beautifully crafted scrolled shank ends (using only hand and eye) , the others are similar but set with stunning gemstones. 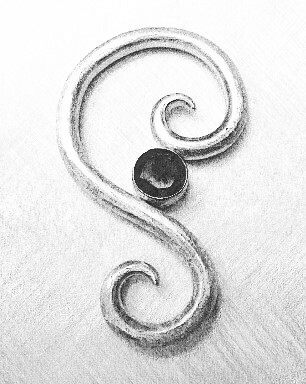 The starting point for the design of these rings was the twirling tendrils of the grapevine. My affinity for the fermented juice of the grapevine is pretty legendary among those that know me (though never when playing with fire in my workshop – far too tricky to juggle a flaming torch and a wine glass at the same time!). The delicate tapering scrolls at the tips of the ring shank pay homage to the tenacious grip of the vine as it climbs to reach for the sun. The taper is created by filing down the ends of a measured length of round silver wire using hand files and emery paper; after annealing the silver to soften it, the shank is formed using half round pliers and brute force, and then hammered around a ring triblet or former to the correct size and overlap. Constant annealing is required as the metal soon becomes work hardened and impossible to shape. Pliers are used to bend the thinner metal to create the scrolled ends; after further finishing and polishing the plain band ring is complete. 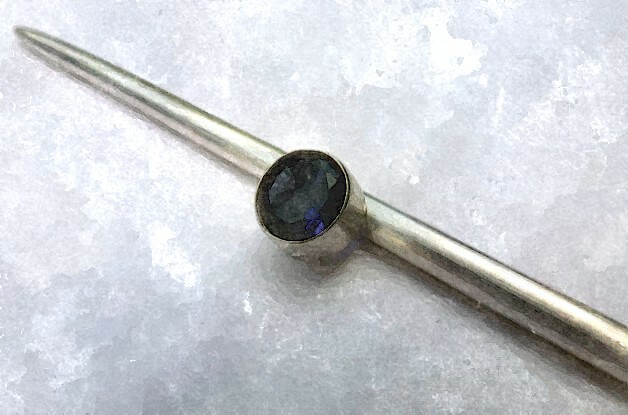 For the gem set versions, a similar process is undertaken to create the shank, but a bezel setting must be made and soldered into place to fit the chosen gemstone. 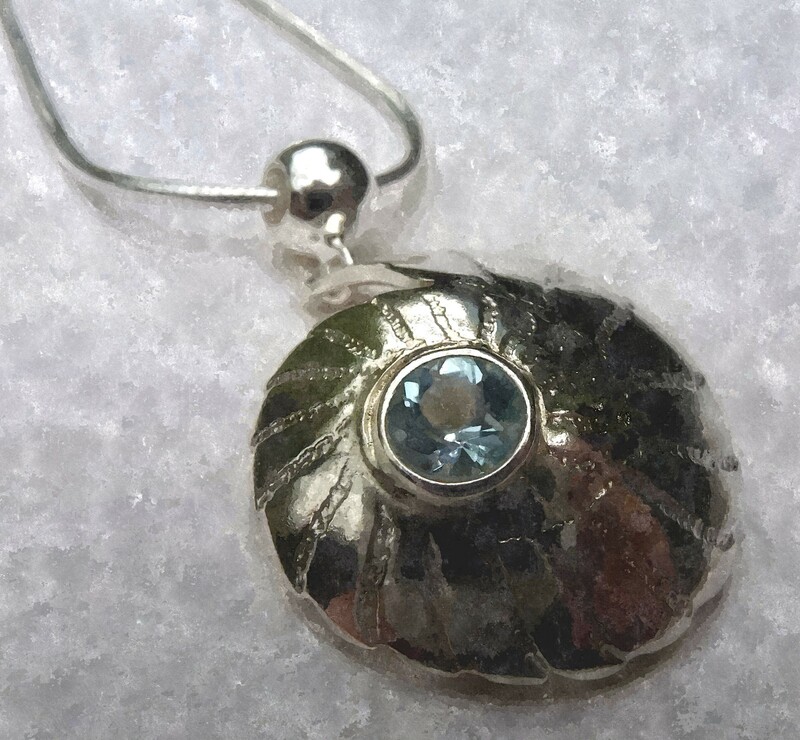 Here I have used a 5mm round Iolite stone and a 4mm round Pink Tourmaline. Both look fabulous in the finished rings. Below are a few more images of the rings, but do take a peek at my studio on Artfire for more information. 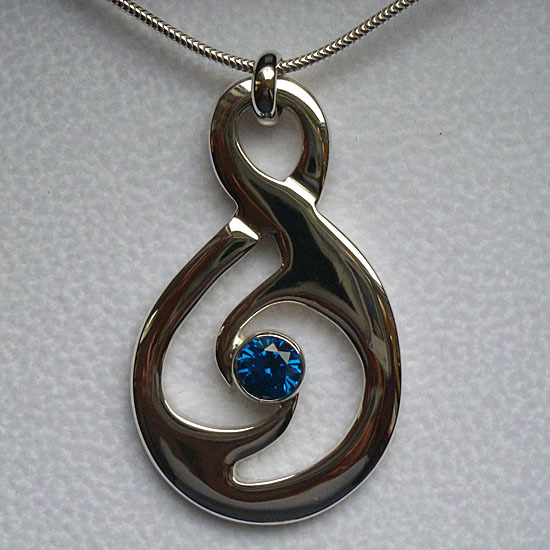 KALEA is an elegant handmade sterling silver pendant comprising circles within circles, bezel set with a 9mm round cushion-cut faceted Teal Blue Topaz gemstone. The split bail design is simple but adds interest to the piece. The outside circle of silver is approximately 30 mm in outer diameter and 2.4 mm thick, the inner circle approximatley half that diameter and 2 mm thick. The Teal Blue Topaz gemstone, being cushion cut, catches and reflects the light beautifully. 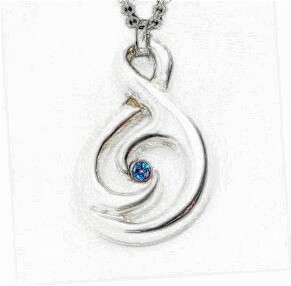 The piece is quite large and is designed to be worn high up around the neck, at the throat. 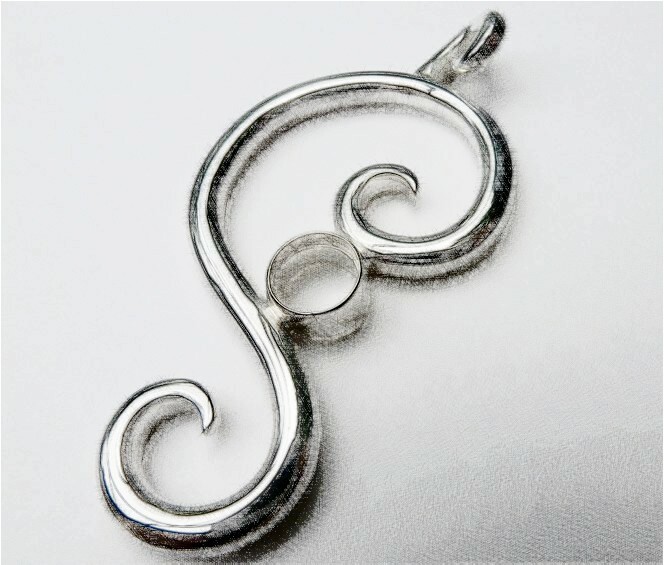 It thus comes with an elegant solid silver rigid wire choker, with a decorative ball & hook catch. The silver choker is 1.5 mm thick and 42 cm around. A statement piece that will definitely become a talking point!